Carbon dots doped with nitrogen and copper have been synthesized via a hydrothermal method. They possess favorable peroxidase-like catalytic activity over a wide range of pH values and temperatures. Specifically, they were used to catalyze the oxidation of ortho- and para-phenylenediamine (OPD and PPD) by H2O2. The resulting products possess different colors (yellow for OPD and brown for PPD), which can be visually discriminated. The corresponding typical absorption peaks of oxidized products for OPD and PPD are at 413 nm and 500 nm, respectively. The method displays excellent discrimination ability and selectivity over potential interferents. The detection limits are 1.1 μM for OPD and 1.9 μM for PPD. The respective linear ranges are from 5 to 200 μM for OPD and from 2.5 to 700 μM for PPD. The method was applied to the quantification of OPD and PPD in spiked natural waters. 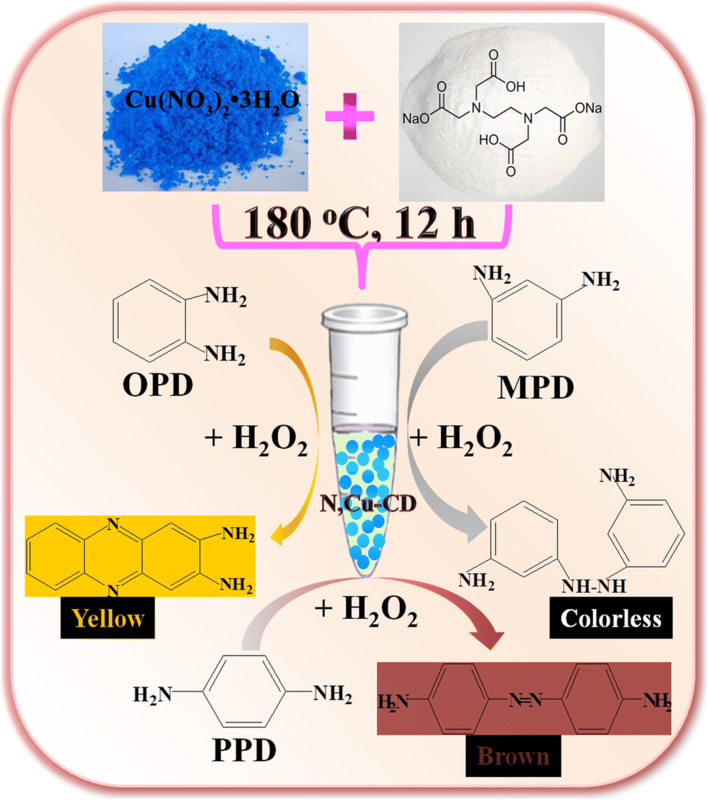 Schematic presentation of the synthesis of nitrogen and copper co-doped carbon dots (N,Cu-CDs) and their application as an enzyme mimic for colorimetric discrimination of ortho-, meta- and para-phenylenediamine (OPD, MPD and PPD). 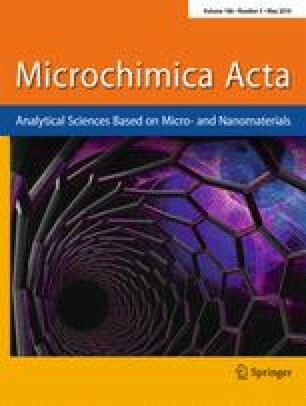 The online version of this article ( https://doi.org/10.1007/s00604-019-3404-y) contains supplementary material, which is available to authorized users. This research work was financially supported by Nature Science Foundation from Science and Technology Department of Fujian Province (No. 2018J05013), Education Research Project for Young and Middle-aged Teachers of Fujian Province (No. JT180136), Outstanding Youth Research Training Program of Fujian Agriculture and Forestry University (xjq201818) and National Natural Science Foundation of China (No. 21876141), which are gratefully acknowledged.